In this multi-media show I bring to life my daring quest to visit every National Trust property and become a certified super fan. 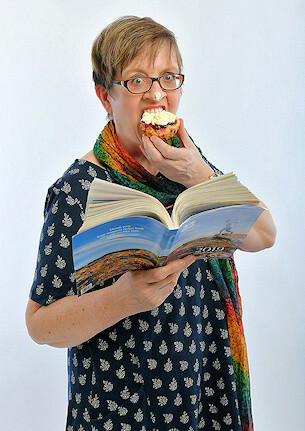 Using a combination of personal stories, historical anecdotes, poetry, sketches, selfies and scones I take the audience on a whirlwind tour of National Trust properties and outdoor spaces around Britain. Fringe Guru described The O.S. Map Fan Club as ‘a shameless miscellany’. The miscellany in this show is just as shameless. 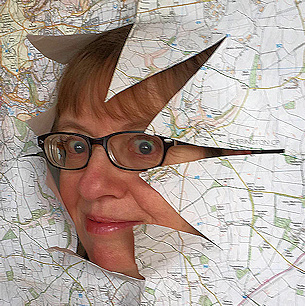 In this show I share my enthusiasm for the Ordnance Survey and their much loved, fold-out, paper maps. During the show I take the audience on a virtual ramble, along the ancient byways of the no. 168, 4cm to 1km, Explorer map. On our ‘walk’ together the audience meet colourful characters, hear amusing anecdotes and pause frequently to admire the view. This fascinating, laughter-filled show celebrates the simple beauty of Britain’s inspiring national treasure. O.S. fanatics, the O.S. curious and O.S sceptics are all welcome at the O.S. Map Fan Club. The O.S. Map Fan Club is script-edited and directed by comedy coach, Chris Head, who has over twenty-five years experience in the comedy business. The show was first performed at the 2017 Edinburgh Festival Fringe and was a sell-out success. Awarded Best Original Act at Swindon Fringe Festival. Jim Goldsmith, Ordnance Survey Cartographer, and now fully fledged new member of the OS Map Fan Club. © Helen Wood 2019. All Rights Reserved.